Let’s start with something I’ve been curious about for a while. How did you end up with the somewhat ironic pseudonym Davey Oil? It’s a much less interesting story than people think it’s going to be. My birth name is David Pasquale Giugliano. I like my family and I feel proud of my name. There was never any intention to create a pseudonym really. I actually took the name Davey Oil before I ever identified as an activist. When I was in college and for many years afterwards I wrote, drew, and self-published comic books. When I was making the cover for my first zine someone was in the studio with me and said, “Giugliano is hard to spell and it’s hard to pronounce. If you’re going to be publishing maybe you should come up with a pen name.” There was a heating oil company named for a family called Davey. I was never called Davey. I had to grow to like it. Anyways, the point is I didn’t try to take it as a nom de guerre, I took it as a nom de plume. I didn’t anticipate that becoming an identity. It was just a name to publish under. Then when I moved to Seattle everybody I knew here I had met through zines and self publishing and those people knew me as Davey Oil. The first time I went out with a group of those people and they introduced me as Davey, it was really jarring. But I just got into it. It didn’t take me too long living in Seattle before direct activism and other riskier kinds of activism became a bigger part of my life, so I did start trying to go by Davey Oil when I was referred to in public. It wasn’t until I worked at Bike Works that I just told somebody that was my name to put on business cards. I got that job maybe seven years ago so that’s when I feel like I made a transition fully. It’s great. I enjoy it. Except I think people assume Oil is chosen because of my own opposition to gasoline dependence. That’s OK, I think it works in that regard. My mom hates it. Back when people would call her house looking for me, she would hang up the phone if someone asked for Davey Oil or if she was Mrs. Oil. She doesn’t play that. The other funny thing about it is people don’t meet a lot of adults named Davey. I get to have this fun thing where almost always men, almost always white people try to pronounce it Devy or Deevey as they try to guess my South Asian or Arab heritage is. It’s a fun moment of confusion. I’m Italian American. Obviously your path to cargo bike proprietor has been fairly winding. What was your intro into the bike world? I grew up on Long Island, which is not a part of New York that’s favorable to the choice I made as a teenager to never learn how to drive. Thanks to Robert Moses Long Island is a place where a lot of car-dependent planning was born. I don’t know why, but from a relatively young age I had this sense that cars were terrible. I was using a bike to get to school or taking really long walks and later getting rides from friends with cars sometimes. I was using bicycles for transportation from middle school. I did get hit by a car in early high school that got me off the bike for a bit. I didn’t self-identify as a bicyclist. I didn’t have an exposure to recreational cycling. I didn’t have any peers who rode like that. All of us rode in a particularly suburban kind of way. We’d ride bikes to go meet each other then we’d throw our bikes on the ground and go inside and get pizza. I wasn’t aware of BMX particularly, I wasn’t aware of mountain biking or road biking at all. I moved to Vermont to go to college and got a mountain bike to commute. I was often on single track, but again not thinking of it in a recreational way. Maybe it’s because I’m from Long Island, but I’ve almost never taken a hike. I only camped a handful of times before I got a job that had a lot of camping in it. So again, recreational cycling wasn’t a part of it, but transportation cycling was. I wasn’t aware of a movement around that. I did attend critical mass a couple of times, but as a very casual thing. I didn’t make the connection to my own struggles or my own need for transportation justice. While I was in college I did a couple of internships in different cities, including San Francisco. I did a real critical mass. Every month the critical mass in San Francisco has a couple of thousand people. That was really eye opening. Right after college I moved to Seattle and from the first month I was here I started attending monthly and didn’t miss one for many years. The G and O of G&O Tyler Gillies, Davey Oil and their children. Photo via Seattle Mag. Was critical mass your introduction to bike activism? Critical mass was in every way my real college. I think when it’s well implemented, or even when it’s just well attended, it is one of the most enriching political opportunities. It’s a chance for people to define the event as they go. It’s like a lot of decentralized political action can be. Like Occupy or a lot of the anti-globalization movement. It was through critical mass that I began to become enthusiastic about bicycle activism. Through critical mass and zines and DIY punk I met people who were more experienced bicycle mechanics than I and were more experienced as nonprofit organizers who were looking to start a new nonprofit in Seattle. It was eventually called the Bikery. The goal was to–and I think it was pretty well accomplished–create a DIY bicycle educational resource where people can work on their own bikes and where working on your own bike can be an opportunity to develop the skills to teach someone else. It was a bike kitchen model. What was specific about our project was we saw a responsibility to focus on anti-oppression values and politics. Not just a bike co-op, but a bike co-op that recognizes and attempts to address systemic oppressions of racism, sexism, homophobia, transphobia, ableism, ageism, and classism. So we created programs and hosted forums and that was really radicalizing and good training for me. Those two positions at the Bikery and Cascade had me running into the people at Bike Works a great deal. They were looking to bring on another staff person who was going to help create curriculum around anti-oppression so they hired me on. I worked for a number of years in the youth programs department then broke off and created another mini-department to shape the volunteer programs and educational programs for adults. As far as bicycling for utility, the thing about being a non-driver is cargo bikes are just a no-brainer once you know about them. They’re the bikes that do more. The question is just how cargo do you want to go? How can you make one fit in your life? The ironic tension is that cargo bikes are an excellent tool for density but not easy to park and store in the denser parts of our cities. I just kind of staged up my cargo bike involvement as I got more and more responsibilities. When I lived in a punk house I needed a cargo bike because I needed to bring home a lot more groceries from dumpster diving and inside the store. Then my thing was I always wanted to have kids. I was actually pretty nervous about whether or not I could maintain a car-free lifestyle or a car-light lifestyle and still have children. But through some of the other forms of bicycle advocacy I was lucky enough to meet a lot of people who were car free and parents. People like Morgan Scherer. Anne and Tim King from the blog Car Free Days. Julian Davies from Tot Cycle. It wasn’t too long ago that everyone who owned a cargo bike also wrote a blog. It was funny because we were the cargo bike blog center of the world. But compared to even Minneapolis probably we had a smaller, less active cargo bike culture. Although I think we’ve overtaken all the other cities at this point. So that’s what happened with cargo bikes and electric bikes. It was about following the tools. And then G&O happened. What year did you come here and start riding Critical Mass? I arrived in 2001 and started riding soon after I got here. What was 2001 critical mass like at that time? In 2001 critical mass was really small. Probably similar to what it is now. Typically 10 or 20 people. Much less visible, much less of an impact on the city, like it is now. Some people worked to rejuvenate critical mass mostly by making flyers and committing to being there and answering people’s questions and making it a fun, friendly place to be. That was around 2005, maybe. Then it really took off. We had a number of years where you could expect any ride year round to bring a few hundred people with a couple of rides in the summer bringing 1,000. That’s when things got really exciting. Then it was only a couple of years before it really got kicked in the nads by a couple angry people and the larger media. For each of these events, something unpleasant happened that was misreported in the media as activists being the problem. That had the combined effect of bringing a lot more police scrutiny on the rides and skewing people’s expectations of what was going to happen on the ride. As often happens with public protest in general, it encouraged people who are maybe a little less mature and a little more excited about the confrontation part of activism to come. If there’s no central organizing principal—it’s only social correction—when enough people show up who want that, that is the character of the ride. That would also then discourage people who were more interested in the social aspect or the empowerment aspect. Year after year we would kind of recover and bring things back to a safer, more enthusiastic, and, in my opinion more politically effective, expression of critical mass. Then we’d be brought back into this [hyper-confrontational] version. The last time that really happened was 2008 on Capitol Hill on Aloha St when a driver rolled over a bunch of cyclists then fled with a cyclist on his hood. Then he arrived on 15th Ave where there was a long line of waiting cars because this incident unfolded slowly. Everyone was just blocking 15th while they waited for the rest of the ride to catch up without really knowing what was going on. All of a sudden a car bursts on the scene at location two and the guy on the hood punches the driver in the face. What’s funny is it was the riders who called the police on this crazy driver long before the punch happened, but by the time the police arrived all the statements were taken from the driver and the people in cars. Reporters only took information from the police statements so the story was, “crazy bicyclist punches guy for no reason” and it took weeks for that to be corrected. Unfortunately before that happened, all of the bicycle establishment had decided that critical mass was the problem. Of course, it made their work a little more difficult as they were heading towards the era that we’re in now, which is very effective within its own frame of inside activism. Really what’s sad about that is they had the power to utilize critical mass in the way San Francisco did to show up. That could’ve been our Amsterdam moment. But I think it was much more instead our opportunity to express our liberal values and our discomfort with confrontation in politics. The whole ride just fell apart from that Capitol Hill incident. Things just dwindled and dwindled and dwindled. You mentioned that critical mass was becoming less politically effective and it was seen by the advocacy establishment as politically damaging. Is there sort of an inevitability to it where cyclists on the activist fringe or at least outside advocacy, they eventually see Cascade Bike Club or Washington Bikes doing the work and feel like they don’t have to get involved any more? I don’t think so. Something similar happened in Portland, though for different reasons. It’s easy to tell the narrative of, things get better so we don’t do critical mass anymore. But, I think the thing to consider about the political effectiveness of critical mass is it’s not a movement, it’s not an organization. It’s just an event. So the only people who can use it as a tool are actually the more established, strategic bicycle movement. It has to be taken on by somebody. And I don’t mean Cascade Bicycle Club should’ve organized the ride. I just mean that they should’ve stood with it and used it as an expression of cyclists displeasure. Or even just used it for it’s numbers and encouraged people to participate to keep those numbers large. It’s not that I think the decline in the size of critical mass means we’ve lost something that the ride itself was offering. It’s that I think there was a missed strategic opportunity to employ something like critical mass to bolster inside activism. If I understand your question, it’s what do we do about the fact that Seattle bike politics have become less radical? Yeah, I guess for you it’s a question of what do we do if it’s less radical. It’s also a question of, is it a problem that bike politics is inside baseball, inside city hall in Seattle now? I think that there’s an important thing to consider. Earlier you framed the question as bicycle activism is on decline or in dearth. I don’t think that’s the case. Groups like Seattle Neighborhood Greenways are very, very busy. They’re bringing in new collaborators and new voices and more diverse voices than we’ve traditionally had in the bicycle movement in Seattle. That’s very significant and very important. While their work isn’t particularly confrontational … actually, it’s not even fair to say that. Every time there’s a child killed, they’re the people who organize memorial walks. I think radicalism is still alive, as I would define it, which is taking chances and potentially risking relationships in order to push politics. I think it’s still vibrant. My point was that minus critical mass, we really have no expression of direct-action activism, oppositional activism around car dominance, around car deaths, around bicycle access. I think that the work of Cascade Bicycle Club, Washington Bikes, these new organizations like Connect Seattle, all these organizations are pushing things forward. We do have an impressive rate of growth in our bicycle facilities and our sophistication about bicycle facilities. It’s really gratifying to have every voice in the city express disdain for sharrows. There are very innovative folks at the helm of our department of transportation. We have a lot of great people in these more establishment positions than we’ve ever had before. I feel very happy about those people and very proud of them. The problem is that we’re already starting from the middle of a left position and we have nobody expressing more than what we reasonable expect to get. Everybody has something to lose, so we don’t get anybody asking for more than they think they can get. It would be great if there was a third force in Seattle saying “absolutely no more deaths” and every time somebody dies, we lay down in that intersection all day so there’s no way to ignore the fact that two children died in a week. This rash of murders by car just reminds me that Vision Zero is a vision. Carbon neutrality by 2025 is a goal. If politics is the art of compromise, we need to start by asking for what we really need, then be willing to compromise back to something reasonable. Davey Oil and his two children. Photo by Tom Fucoloro of Seattle Bike Blog. You mentioned in there the importance of bringing more diverse voices into advocacy. It seem like to some extent in Seattle and more so nationally, a lot of the momentum of the progressive and radical bike movement is people calling out the white, dude majority of bike advocacy. It seems like there’s more energy around that right now than around radical movements about infrastructure, etc. I don’t think there’s one that’s more important than the other, in this case. I think we need to encourage more diverse voices in our planning discussions and transportation activist discussions as fast as we can. We are the worst expression of the problem that the environmental movement at large already has. The fact that we’re not represented by people of color, the fact that on higher levels of the legislative action side of things we have so few females voices, that has a tangible effect on the lack of sophistication in certain parts of our analysis as a movement and on our ability to compromise. So I’m totally fine with certain activists spending a large portion of their time crying out about that one issue as often as possible. I think that’s totally fine. I think the fact is, I would like to see myself as part of a transportation justice movement as a subset of a climate justice movement and that has to involve simultaneously the needs of the poor and the needs of transportation cyclists. In Seattle as a movement we’ve slowly crept towards that. As a national movement we’ve added equity to our five Es, or eight Es or whatever it is. But locally, we’re still in the tokenizing people of color phase. Sometimes that leads to positive things. Sometimes that leads to the voices of certain people of color being amplified in ways that have been very helpful for doing something about the constant injuries and deaths on Rainier Avenue. What do you think about when these things happen? The way you framed the question it seems like to some extent you think that’s a distraction? That is true! I think there’s something fascinating going on where the movement at large is tokenizing certain people as it grapples with its lack of diversity and it’s creating this sort of grating tension where some people with good ideas are getting amplified, but those ideas are also ignored sometimes. 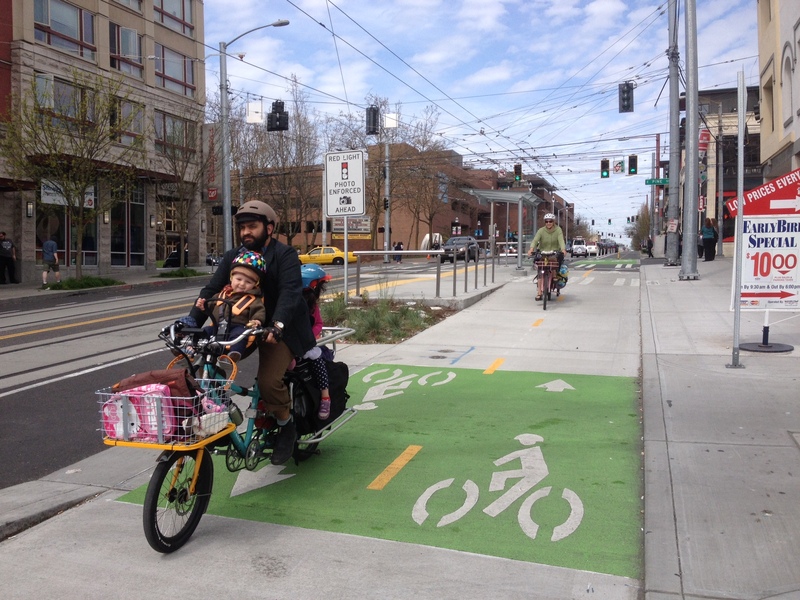 Jumping back to your business life, what’s happening with the family biking boom in Seattle? Our shop is a physical manifestation of the boom. We opened expecting to sell 12-20 cargo bikes in a year and we sold that many in the first six weeks. We have the highest volume of sale of any cargo bike shop ever in the US. We’re always full of people from the moment we open to the moment we close. It’s just growing and growing. You can’t go for a ride anymore without seeing people riding with children. What that leads to is a new category of people riding bikes for transportation. They’re people who largely chose to start family biking not from being so committed to bicycling, but instead being so committed to parenting and wanting to find ways to make their family life more enriching. Traffic and driving and time spent in cars is one of the biggest frustrations people have with parenting. Being able to replace some of those trips with bicycle trips is rewarding for all the reasons bicycling is rewarding in general, but is amplified by the fact that it’s also rewarding for your children. It’s quality time, it’s fun time, it’s an adventure. It communicates to our children values that we hold important. 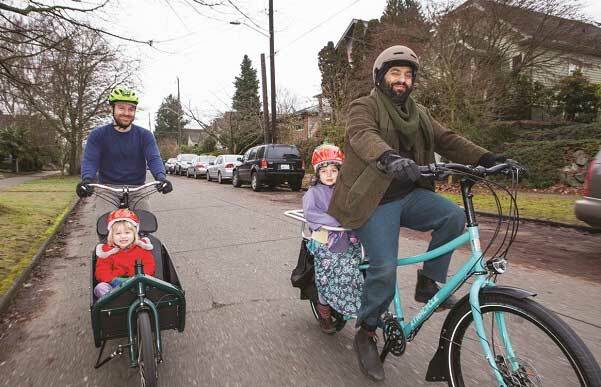 There’s an intersection of the growth of Seattle’s family biking movement and the vibrancy of Seattle Neighborhood Greenways. They bring childcare to every event. Through family biking, there is a really powerful cohort of committed activists who are also working moms, stay at home moms, dad’s too, and their children. You can see it every time there’s a public hearing. Nobody’s working really hard to drum up the children for these kinds of events. We’re just showing up with our children. I think the family biking as activism and advocacy is really fascinating. You’re bringing average jane and joe in because they want this more convenient way to get around and it serves to normalize bike commuting and biking as transportation. Totally. If you just yelled at someone for being in your way who’s dressed like they’re on a recreational ride, then the next bike you’re about to overtake actually has three people on it and two of them are playing paddy cake, then maybe that encourages you to be a little more humane about the whole thing. It reminds you of something bicycle movements are always trying to point out, which is that we’re not cyclists. We’re moms and dads and daughters and sons and accountants and soccer players. I think you’re very right on. It’s because we’re normal people. I love freaks. I love radical DIY bohemian punk queers as bicyclists. But it’s very, very gratifying how the community built around our shop includes as many discussions about bed times and summer camps and breast feeding as it does about bikes and gear. That’s an integration of bicycling into our lives that doesn’t require your lifestyle to be molded around the bike. It’s kind of an Amsterdamized approach. And nobody’s making that. We didn’t manufacture it. We are inspired by it and are participating in it. Sure, because we can fix the bikes and we can research them and we can sell them. Our thing to is to some extent taking a curatorial role in the thing. There aren’t many, but there are some cargo bike and electric bike options out there that we don’t think are appropriate in terms of quality to use in Seattle. I know so many people that have spent so much time and money making a budget option work. I feel a lot of tension around that because we didn’t set out to run a high end bicycle shop. We want to it be beautiful and I recognize that really nice stuff costs a lot. I also recognizes that not every cargo bike or family biking rig needs to be really nice. You don’t need to the newest, most flashy thing. But I am committed to talking to people about where the compromises will come up. It’s been fun to find a few different brands, a few different bikes that are a lot less expensive than what we offered in our first year. And we worked a really long time to find a loan that would be favorable for the consumer so that we can offer financing. It’s not an exploitative loan. If you pay it off in full there’s no interest applied. Those are the kinds of things we can do. 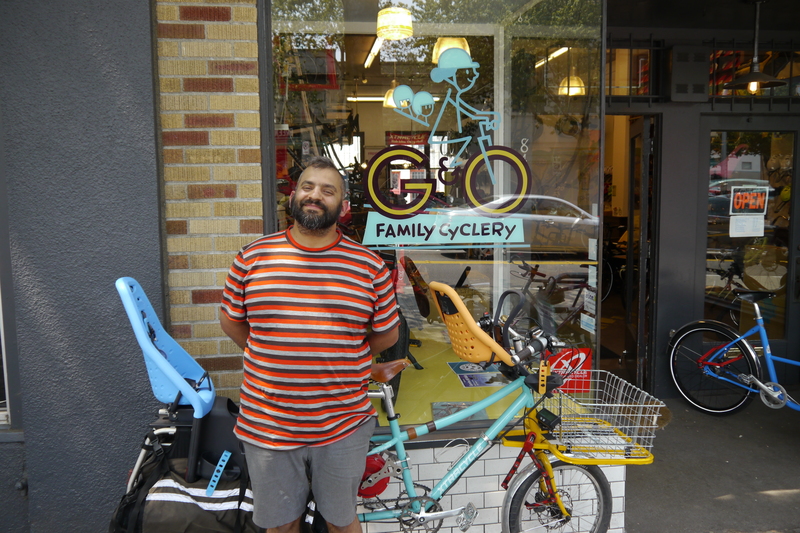 I would hate to hear that our commitment to quality and the fact that our shop is a little fancy looking discouraged someone from getting started on family biking. But luckily we’re not the only voice. There’s a lot of other approaches, a lot of other advocates out there who can teach people about family biking out there. We’re just part of it. This entry was posted in Advocacy, Bike Industry, Interviews and tagged bike activism, bike equity, bike works, cargo bikes, cargo biking, cascade bike club, critical mass, cycletruck, davey oil, diversity in cycling, family bike boom, family biking, g&o family cyclery, longtail cargo bikes, seattle critical mass, seattle cycling, the bikery. Bookmark the permalink.